ANCHORAGE (KTUU) Turnagain Social Club is an adult day services facility specializing in Alzheimer's care. 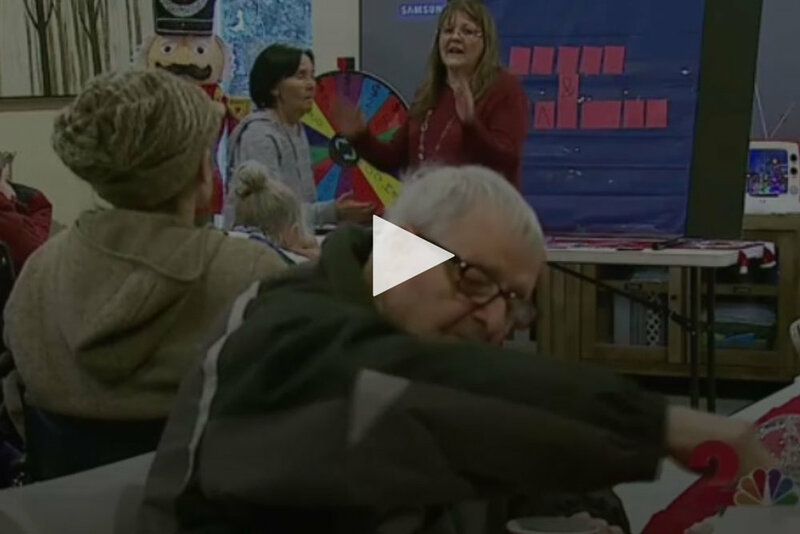 It's here where people find social and therapeutic day services for Anchorage's seniors.Monday morning a Channel 2 photographer spent time with the seniors to learn how games are keeping minds fresh-- and happy. In this video you'll see how people are staying healthy, and active using play to stimulate their minds. Bacon "works" at the Turnagain Social Club where she provides a sensory experience for members there. Turnagain Social Club is a senior center, open Monday through Friday, specializing in Alzheimer's care. The facility provides social, mental and physical stimulation exercise, games and various sensory rooms. It also provides Bacon the pig. ** Note - We are sorry to say that Bacon is no longer with us at Turnagain Social Club. I'm sitting in the office of Turnagain Social Club, early on a foggy, frigid January morning, and I hear loud chomping. Not to worry," I'm told by Kori Mateaki, owner and president of the facility. "That's just Bunsy, eating some old paperwork." Finished chewing, the biggest bunny I've ever seen comes thumping across the floor to nibble my shoe. Kori Mateaki gets help from the animal world to care for adults with Alzheimer's disease and other degenerative disorders at the recently opened Turnagain Social Club. Bacon, a 3-month-old pot-bellied pig, does her part to provide social interaction, exercise assistance and entertainment. For the clients, Mateaki says pet therapy can be beneficial for people experiencing depression, anxiety and pain. "And she's a vacuum cleaner, too," she said. "Anytime anybody spills, she's right behind them to clean it up." On a recent Thursday morning, inside a building that used to be a church, a handful of seniors and caregivers gathered around a table to decorate cookies and paint pumpkins. In a computer room next to where the group had congregated, a 3-month-old pig named Bacon zigzagged about. Kori Mateaki opened Turnagain Social Club — a new adult day-services facility — because she said she saw a need for a social gathering place for the elderly where staff also cared for people with degenerative disorders like Alzheimer's disease. The facility is nestled in a West Anchorage neighborhood, located a few blocks away from the Rustic Goat restaurant." "Turnagain Social Club offers a stimulating learning environment for adults ages 55 and older. "If we can delay the onset of Alzheimer's by about 5 years the healthcare cost savings are tremendous," Kori Mateaki who is the Owner of Turnagain Social Club said. But the organization, is not just for Seniors who have degenerative neurological conditions, it's for all Seniors in the Anchorage community. "We're trying to provide an all-inclusive disability or not kind of service," Mateaki said. The Social Club has one staff member for every four clients, who spend four hours Monday through Friday participating in activities for brain stimulation. In addition to the over 500 different activities Turnagain also has a pet pig and a pet Flemish Giant Rabbit." Copyright 2017 - Turnagain Social Club LLC - All rights reserved.